Patient of the Family Foot & Leg Center, PA in Naples FL was seen for a trauma of the other foot, trauma taken care of in surgery, but he had a dark spot on the other leg. Started about 5 years ago after he had scrapped his leg on an object and started bleeding. No history of cancers, etc in the family. He was not even sure he should have even brought this small problem up to me. Given the pattern of this and that he was not born with this lesion a 3 mm punch biopsy was done. Behold the report came back malignant melanoma. Instant referral to a dermatologist and general surgeon was made for more definitive care and diagnostics. 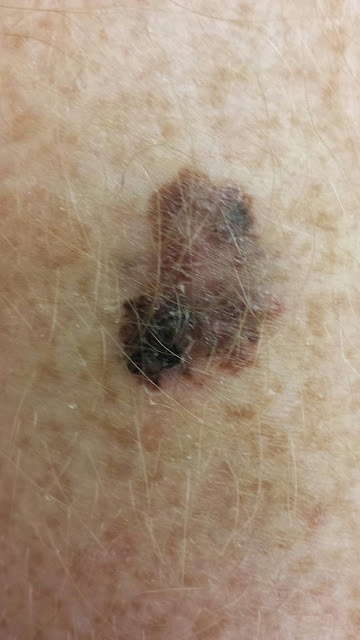 Malignant Melanoma on the foot is the 2nd deadliest cancer a man can have, this is in the leg not much better. Possible treatments can involve a below knee or above knee amputation depending on spread of this disease. 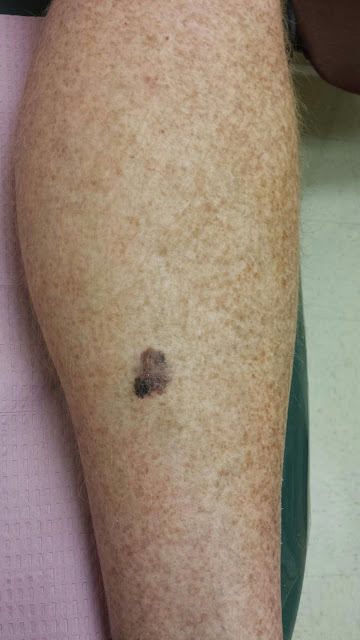 Update:Patient's melanoma is the superficial spreading kind which is very much on the surface. Dermatologist removed a majority of it and then an oncological surgeon removed the rest along with a lymph node biopsy. Patient's leg and life saved.